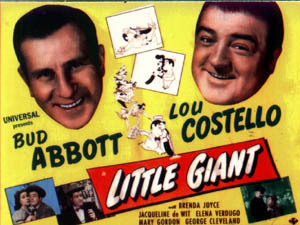 ABOVE: The publicity for "Little Giant" seems a bit vague, but that's nothing compared to "The Time of Their Lives", which shows Lou in modern dress, kicking Bud! resulting string of comedies served as the perfect complement to the monster shows that up to then had represented the major cash draw for the studio. remembrance, his wife Anne had a silver bracelet made inscribed with the boy's name. Lou wore it, refused to ever remove it (he saw to that by having it welded in one piece around his right wrist) and if you look closely, you can spot it in just about every A&C film from 1944 on. As aptly put in the book "Abbott and Costello in Hollywood" by Bob Furmanek and Ron Palumbo, "Much of the little boy in Lou Costello died with his son". up by the classic "Fleugel Street" routine (here called "Bagel Street"), providing laughs a mile a minute. It looked as though the Abbott and Costello engine would go on unabated as four productions followed: HERE COME THE COEDS and NAUGHTY NINETIES (both 1945 for Universal), LOST IN A HAREM (1944) and ABBOTT AND COSTELLO IN HOLLYWOOD (1945) for MGM. But as faithfully as 1945 followed the Abbott & Costello hit pattern, the following year would veer from it. disastrous start as a salesman, Benny leaves for a smaller branch of the company in Stockton, managed by Tom Chandler (also Abbott), Morrison's nicer and more respectable cousin. However even Chandler sees little promise in Benny and instructs his secretary Ruby (Brenda Joyce) to give him his walking papers. measure appoint him manager of the Cucamonga branch! Mother and son are reunited, Martha forgives all, a quick pratfall over the bottom half of a dutch door, and "The End - a Universal Picture." should have at least a smidge of the old formula, sort of as an insurance policy. Short of this there are only fleeting moments where any "team familiarity" exists between the two. No, this was Costello's moment in the sun, his comedy of pathos, and to some degree in certain instances, he succeeds. contrast to Lou's emotional, teary-eyed closeup only makes the scene funnier, but perhaps that is what Seiter was going for. Shortly after, maybe 20 minutes into the story, Lou's dejection and sad walk out of his uncle's office when he's denied a job (on his first attempt) doesn't ring true; the film seems to be going for poignancy at too early a moment. There are a few occasions on which we do indeed feel for Lou's character: The barroom scene in which his coworkers seam him into believing he's a mind reader, playing on his farm boy naivete, stuffing cotton in his ears, blindfolding him and leading him around like a pin-the-tail-on-the-donkey game. At one point the group asks him about the cows on his farm and have Benny mooing at the top of his lungs. neatly with the urban world in which he has tried to prove himself and adds the correct touch of melancholy. Finally there is a brief but effective sequence in which Benny loses the canary he was bringing home to his mother. The moment is understated, and hits just the right note. and devious E. L. Morrison. touch of lightness to the ambience of the big city, a world in which Benny just does not belong. Jaqueline De Wit and Brenda Joyce are reliable, and the brisk dialogue and bouyant pace make it a diverting, if not hilarious, 91 minutes - their longest film. superior to the whole, the change in formula a refreshing interlude, and worth another look. way, a tipsy and conniving butler on the estate of Tom Danbury. Danbury is a traitor and conspirer with Benedict Arnold. Lou Costello is Horatio Primm, freelance tinker in love with Danbury servant girl Nora (Anne Gillis). Horatio will soon be able to marry Nora with the help of a letter written by General George Washington, his endorsement lauding Horatio as a true patriot. Cuthbert also has eyes for Nora and has the visiting Horatio locked in a trunk in the stable. Meanwhile Danbury's intended. Melody Alien (Marjorie Reynolds), overhears Danbury's plans to sell out Washington, frees Horatio and the two of them set out to warn the Continental Army. During the confusion Nora is abducted, Horatio's letter taken from her and hidden in a clock. Cuthbert steals Horatio's horse and belongings as Danbury Manor is burned to the ground. En route to help. Melody and Horatio are shot down by American troops who mistake them for traitors. The soldiers dump their bodies into a nearby well and issue a curse (in a very effective scene): unless evidence proves them wrong, their spirits "shall be confined to Danbury Acres 'til crack of doom". Some 166 years later, Sheldon Gage (John Shelton), a playwright, has the estate completely restored and unveils it to his girifriend June (Lynn Baggett), her aunt Millie Dean (Binnie Barnes), and Dr. Greenway (guess who? ), a psychiatrist and descendent of smarmy butler Cuthbert. Also on hand for the appropriate ambience is a psychic maid, Emily (Gale Sondergaard). Horatio and Melody decide to haunt the estate and at the same time search for the letter from George Washington that will prove the little tinker is a patriot and free him from the curse. Once inside, the target of the haunting quickly becomes Dr. Greenway, Horatio actually believing that Cuthbert is still alive ("They say only the good die young!"). refuse to allow an examination of the clock, Greenway takes it upon himself to clear the family name by "borrowing" it. After a madcap chase with the state police, the letter is recovered and the two ghosts are released from the curse. separation from Lou as acutely. Whereas almost anyone could have played Bud's character in LITTLE GIANT, the laughs in this picture come from his being uniquely "Abbott" (his standard advice during the hauntings, "Be calm - be reasonable!" finally driving everyone crazy). There is also a situational closeness here, the comedy has more spirit (pun partly intended) and the boys seem more connected, due to their characters' link with the past. One thing needs to be understood - TIME OF THEIR LIVES is a good film, regardless of comparisons to LITTLE GIANT or any other Abbott and Costello film. It works on its own merits due to a strong story and solid characters. We are immediately involved with Horatio and Melody, as we would be with any innocents trapped in a prison, yearning to be reunited with loved ones. It also has the benefit of a strong director in Charles T. Barton, in his first of many films with the team, the most notable being his fifth outing with them, 1948's ABBOTT AND COSTELLO MEET FRANKENSTEIN. even pays a nice tribute to his new director early in the film via an inside joke when he excitedly tells Nora that "At Barton's Barn, I had a brush with the British". didn't always need Bud as a counterpart. to experience uncanny events with nobody to believe him. There's something refreshing about the shoe being on the other foot for a change! Bud's restraint in his reactions plays well here (as compared to LOU'S over the top histrionics in their other pictures), and just as Lou romps comfortably through the show on his own. Bud again fits in very neatly with the rest of the cast and proves again that given the chance, he might have become a solid character actor. Of the two films in which the team was "broken up", TIME OF THEIR LIVES is clearly superior, and works best. due to, in Bud's words, "stupid pride". wait another ten years for that, succeeding primarily in a few television dramas and some appearances on The Steve Alien Show. LITTLE GIANT remains a diverting experiment, carried off with efficiency. 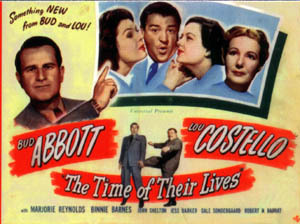 TIME OF THEIR LIVES is a strong, whimsical, and undeniable gem of a film fantasy, a winner at the box office and loved even by those not entranced by the talents of Abbott & Costello.